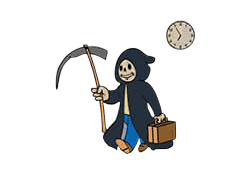 Grim Reaper's Sprint is a Perk in Fallout 4. It is associated with the Luck Stat. Rank 1:Death becomes you! Any kill in V.A.T.S. has a 15% chance to restore all Action Points.